Visiting Modiano Market is a must. Known as one of the most vibrant areas of Thessaloniki, with the hustle and bustle of activity six days of the week (closed on Sunday). It’s a trip that will not disappoint. An area of small and medium size shops encompass a labyrinth of stalls selling everything from food to clothes to toys. It’s truly a feast for the eyes. Modiano Market is full of locals as they go about selecting their produce from the numerous choices available. It’s an area buzzing with life, full of chatter, mouthwatering aromas with a feeling of warmth. From the meat stands, of which there are many, to the fish stands with every type of fish imaginable, everything is laid out with precision. Each vendor trying to entice customers to purchase their produce, “latest catch of the day”, “best prices”, “perfect for dinner”, “come in to see more” might be some of the chants heard along the way. It’s common to see the butchers chopping their produce from hanging hooks while locals and tourists mingle to check out each stall. Water is constantly flowing over the beautiful display of fish freshly caught from the sea. The aromas of fresh baked goods and coffee beans are enough to make any mouth water, it’s difficult to resist. There is something for everyone, locals and tourists alike whether you are shopping for dinner or looking for a snack along the way; you will find what you are looking for. As you navigate your way through the maze of vendors you will also come across stalls selling clothes, pots, pans, nuts, herbs and spices, as well as the cheeses. Greeks are famous for using in their dishes: feta cheese. Greeks are also proud for a great number of local cheeses that have great combinations with Greek wines. Ask your local restaurant for a variety of Greek made cheeces; you will be amazed. Just in case you were worried Modiano Market didn’t have enough, the largest flower market in Thessaloniki can be found here as well, referred to as Louloudadika market. Unique souvenirs for tourists can be bought here, including cosmetics made with olive oil from the area. Whether you are a local shopping for home, a tourist shopping for souvenirs or a passerby looking for something to eat, the choices are endless. We strongly recommend you visit Modiano market during the day. 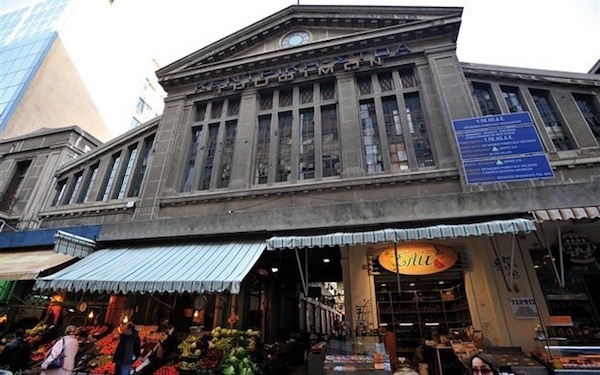 This amazing market is bordered by Vassileos Irakeliou and Ermou Streets; a convenient location as it is not far from Aristotle’s square and the Ladadika area, two other strongly recommended areas to visit.